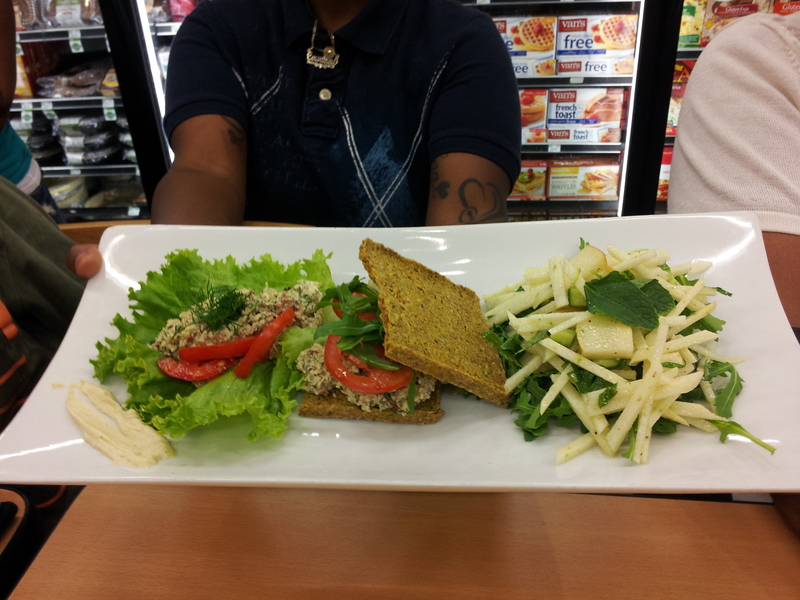 Last week I attended a Raw Food cooking demonstration at my local Whole Foods. Chef Stacey Dougan and RAW Mixologist Shane Stewart showed that you can get pretty creative in whipping up tasty raw food dishes. To add to the challenge, everything they made was not only 100% uncooked and unprocessed, it was also 100% vegan. On the menu for the night was a Mock Tuna Sandwich with Stone-Ground Cashew Mayo, Cucumber-Jicama Asian Pear Salad, Thai Pumpkin Soup and Carrot Mango Gelato. The mock tuna sandwich was especially tasty. Instead of using fish, Chef Stacey substituted with what the fish eat — several type of kelp and seaweed. It did have that slight tuna fish taste, and I decided that I actually liked the mock tuna sandwich better than the real thing. With the addition of the cashew mayo, it was spot on. While I like the idea of adding raw, vegan meals to my diet occasionally, I don’t think I could do it in the long-term. For starters, I would have to give up many dishes that I currently love, especially baked bread. Also, it seems that many raw food recipes have expensive ingredients, and there would be a rather large upfront investment cost. Most of the recipes made at the cooking demo were made it a VitaMix, which costs in excess of $400, and some contained pricy ingredients such as nutritional yeast and liquid aminos. For the record, neither of our instructors admitted to eating raw, vegan foods all the time. Although Chef Stacey is vegan, she does enjoy an occasional cooked meal, and Shane indicated he’s a pescatarian. Still, an occasional raw food meal could add a bit of (healthful) diversity to one’s diet. 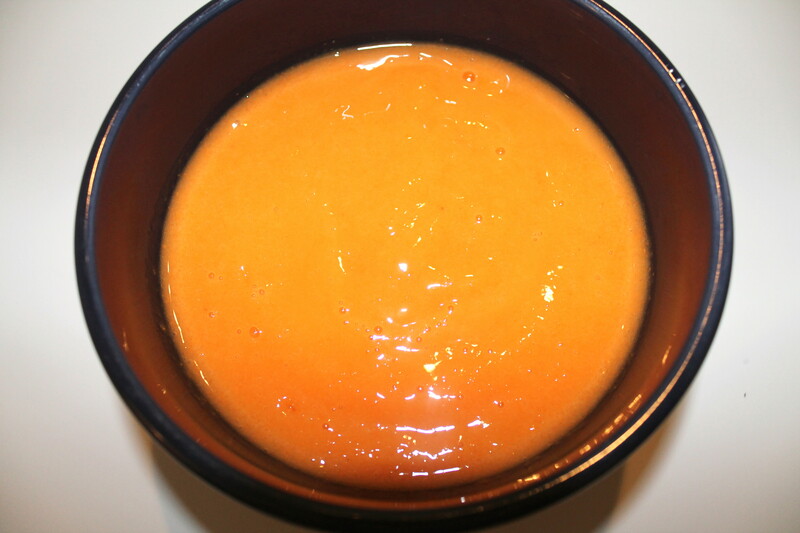 After the class, I was anxious to try out one of the recipes, so I chose the most simple and budget-friendly: Carrot Mango Gelato. 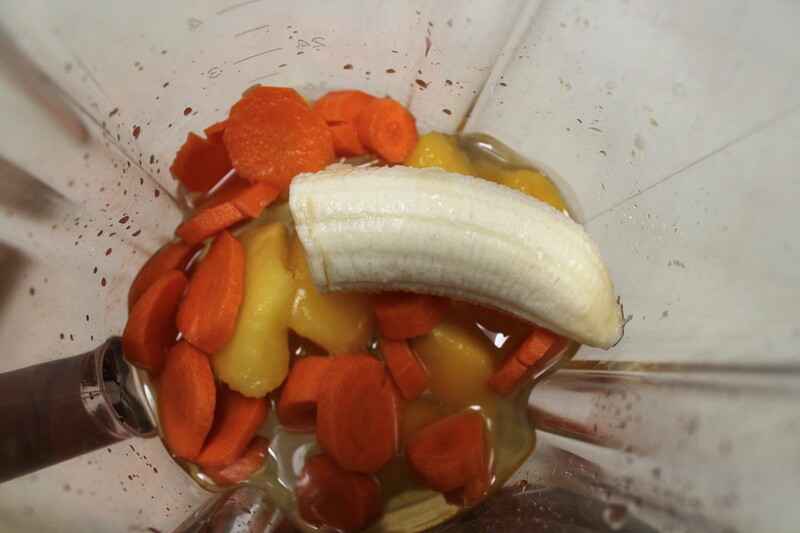 To make, it’s as simple as combining all ingredients into a high-speed blender and mixing for about 20 seconds. The gelato I made at home came out with more of a pudding-type consistency, but the one made at the cooking demo with a VitaMix actually had more of the consistency of true gelato. However, my ‘home version’ was just as tasty as the one we sampled in class. 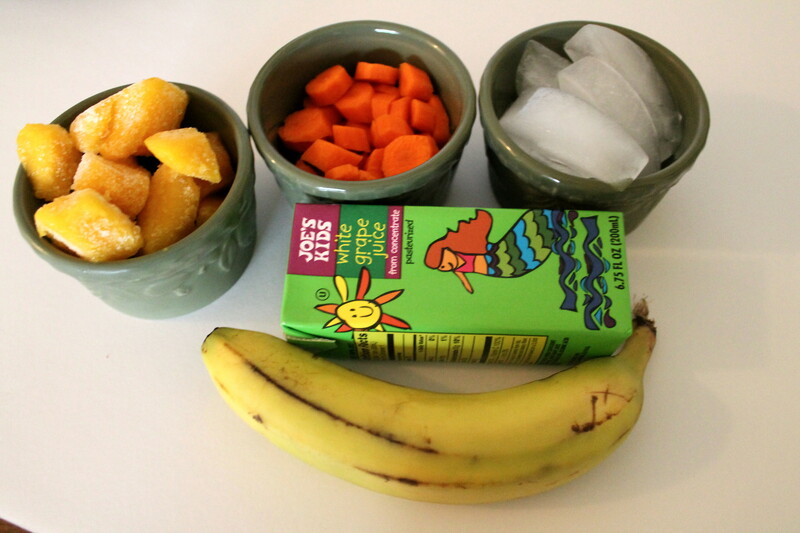 You can’t go wrong when mango is involved. If anyone has recommendations of low-cost, raw, vegan recipes please send them my way! This entry was posted in DIY, Green Living, Healthy Living, Recipes, The Simple Living Experiment and tagged dessert recipes, healthy living, raw food diet, recipes, vegan recipes. Bookmark the permalink. Sounds so refreshing and yummy, Becky. I’m definitely going to try this one. I think even Mike would like!